fees and to get the goodies! colored glasses for the North American Mini event of the year! around Cherokee, North Carolina. The theme is 60's Hippie! If you don't have a tie dye shirt, not to worry, it's the event shirt! And we'll supply the rose colored glasses! Hosted by the CMU Florida Chapter and members from around the world. By now you can see that this is going to be a special 60's event. But to complete the 60's Hippie theme we need some Flower Power! Not to worry, we're having it when the beautiful mountain flowers are starting to bloom. So, come join your Mini friends and family on what looks to be an historic event! This year we are going back to Cherokee, NC for the base of our 3 day driving adventure. It's located at the south entrance of the Great Smoky Mountains National Park, and at the beginning of the Blue Ridge Parkway. As with all of our CMU events, we like to drive, and that's what we'll be doing. We will have drives each of the three days with plenty of stops and things to see. Of course we do a lot more, read on! Our international events are always based at a campground (with an overflow hotel close by). With this location we'll be able to get almost everybody staying at the campground. The KOA campground we chose is huge! 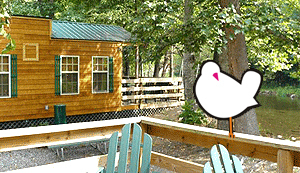 There is plenty of everything from tent, RV, basic cabins, to hotel quality cabins along the river. There's even a stocked trout pond! The only reason to stay at the alternate hotel is that you tried booking the KOA too late! All of the drives will start at the KOA. Worldwide contest for all CMU members! The Mini Hippie Film Festival will be shown during the Hippie party Friday night! Even if you can't make it to the event, you have a chance to show off your short film and win some $$$$$$. 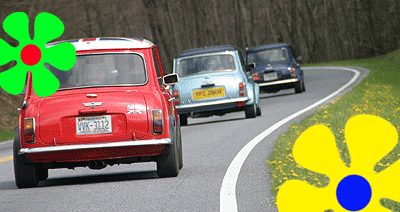 Rules: Entries are open to all Classic Minis United members around the world. The entrant does not have to be present to enter. The video entry is limited to 4 minutes and must have some classic Mini content. 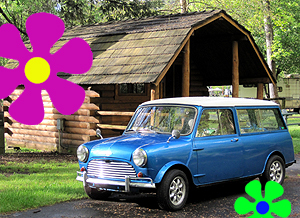 Content doesn’t have to have anything to do with Hippies, it’s just the Mini 56 theme. No offensive or obscene videos will be allowed. Total festival time will be 1 hour 15 minutes. If more videos are entered than the allowed Festival time allows, CMU staff will judge the videos and choose the top entries for the allowed time. Judging: Everybody in attendance will have a ballot to vote on their favorite video. Winners will be announced at the drivers meeting the following morning. The winners in attendance will receive the cash award. Winners that are not able to attend the Mini 56 will be notified within 5 days and paid through Paypal. If you haven't been to a CMU event before, we do it differently; we like to drive/cruise a lot and see all around the area we're visiting. With this being a CMU event, you must be a member to enter a Mini. Membership is free, go to the join page and become a member! As with all of our events, this is for everybody, but all of the drives/cruises/anything is only for classic Minis and its variants produced from 1959-2000, no exceptions. 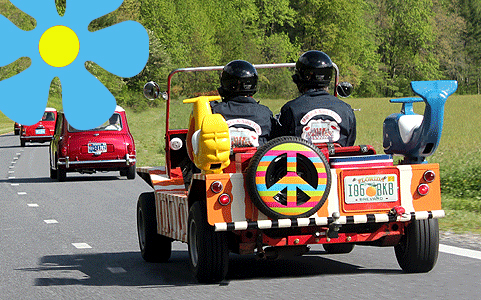 There's always room to ride in someone’s Mini if you come in something else. We don't leave anybody behind! MiniWorld Magazine - The Mini 51 - Here's the full printable story. "As a follow-up to the landmark Mini 50, CMU surpassed themselves with the Mini 51 "
"Everyone witnessed the truly unforgettable sight of the endless line of Classic Minis twisting through the mountain curves." MiniWorld Magazine comments on our Mini 50 event. "Many people who went said it was the best Mini event they'd ever attended." "The event set a new standard for USA Mini meetings..."
Mini Magazine also comments on our Mini 50 event. "... it raised the bar of what should be expected of a show in North America." "... can't wait for the next CMU event!!" If that's not enough, see our Mini 50 and Mini 51 stories! If you would like to join in with others and make your trip to/from the Mini 56 more enjoyable and safer (parts and service help) go to our CMU Facebook page and connect with other members. Share your plans, where you're coming from, things you're bringing to the swap meet, local beers you're bringing, and your days as a real Hippie!...... Go HERE to join in. Imagine almost everybody being able to stay at the campground, we're doing it again! From hotel type rooms along the river that you can share with your friends/family to tent spots, RV spaces and basic cabins, this will be Hippie Mini Town USA for a few days. Go HERE for the pricing/contact and additional information. Do this ASAP before the tourists take your spot! The Cherokee Lodge is the closest hotel (and nice) to the KOA. 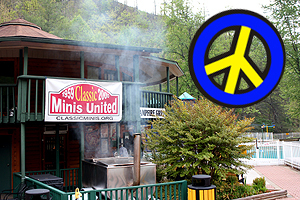 Call them direct at 828-497-2226 and say you are with Classic Minis United. The costs per night, including taxes is $65.20 for Wednesday and Thursday, and $76.25 for Friday and Saturday. They are only able to hold a handful of rooms, so book it fast or you'll be way down the road or in a tent! Important: New to CMU events! As many of you can imagine, when you get 75-100 Minis in a long line/cruise, things could happen. Due to the growing size of the event, we took a close look at safety. We concluded, to keep everybody informed at all times regarding road/traffic/Mini problems during the drives, 2-way radios are now mandatory. Below is an example of what we ran in to the last time in Cherokee. It went from clear to this fog around a blind corner. If you don't have a radio with sub channels, you can rent one. The rental of a club radio/charger is $15 for the event. The registration form will have place to order the rental or to let us know that you have one. The club uses channel 7 sub 9. If you don't already have a radio and want to purchase one, we'll save you some research and give you the magic answer away from all of the misleading promises on the packages! It's all about power and all of the "affordable" radios have the same amount. So, here's the main difference to look for... You want a radio with GMRS channels as they are about twice as powerful as the basic FRS channels. Power is distance! Go to Amazon or Google and search for "GMRS Radio" and start shopping. Most come in a set, so split it with a Mini friend (make sure it has 2 chargers)! It's a safety issue and the cost of a radio is nothing compared to what could happen if you don't have one....... Please note that the radios are for this purpose only, no chatter, no "Oh look a chicken"! From some of the members suggestions, we're going to try something new at this event, two drive groups! Being at the rear of a 75 Mini line means you're almost always trying to catch up. But you put yourself back there so you could go slow... What to do?!?! We'll have two drive groups that do the exact route, the "Spirited" and the "Touring". There will be a Cruise Master to lead each group. The Spirited group will leave first and the Cruise Master of the Touring group will start directly behind the last Mini of the front group. The difference will be that the Touring Cruise Master will re-start the pace, a little slower. The time difference to the lunch break and then back to the camp should be around 15-30 minutes. This will be the first try at this, so lets see how it works. Registration - Now open, Register now! Registration must be received by 3-13-15 for all of the goodies and no late fees! The cost is once again North America's biggest bang for the buck at $30pp and $15 per Mini! The price is the same for one day or all three, so come for the entire event for one low fee! Thank our sponsors, members that donate to the silent auction, and creative event staff for keeping the cost soooooooo low! Go HERE to register! You can't have a Hippie event without Hippie shirts! This year we have a stand out tie dye T-shirt and sweatshirt that has already had members from around the world wanting one. Sure you can try to be cool without one, but to be truly cool and totally groovy, you'll need at least one! Friday will be the official Hippie Day, as we will have a spot for group photos and you'll already be half dressed for the party at night! Along with a great look, the quality is second to none as member Ron Jernigan of Sussex Screen Printing will be printing them. Order them on the registration form before the deadline to make sure you get one. Note, there will be minimal amounts for sale at the event, so pre-order them in time! NOTE: The sweatshirts will be dyed to "match" the T-shirts. BUT, we have to sell 24 to get them made. If you order one and we don't make the 24 minimum you'll get a refund. Order two so we can get them! Stay warm while looking cool! If you want a shirt/sweatshirt, but can't make it to the event, go HERE to order them. Due to shipping, this is just for US addresses. The deadline to receive your order is 3-13-15. During the Friday night party we're going to have a best dressed Hippie contest! Don't be shy, dig out your groovy threads and win some great prizes! You can compete as a couple or by yourself. The crowd will be the judge, so everybody will be involved and have a great time. Start getting it together now! Mini Sport USA will be supplying the prizes. Schedule - Note please keep all of your "parts for sale" hidden until the swap meet! Everything is at or starts at the KOA. Look for signs. Wednesday: Registration at night, please try to register then! Thursday: Early registration. Day drive to be announced. Following dinner on your own, we'll have our traditional ice cream night cruise. Friday: Early registration. Seasoned Cruise Master Chuck Gaines will lead a full day cruise that will be a good mix of driving, stopping, sightseeing, and eating. Then for the evening, we'll have a swap meet, beer tasting, and a silent auction, before the catered dinner. Following dinner will be the best dressed Hippie contest! Saturday: Early registration. Day drive to be announced. Then we'll all meet back at the campground for some story telling, relaxing, and goodbyes around the campfire. Sunday: Head home and think about how much fun you had while dreaming about the Mini 57 in October 2016! If you would like to help make this event the biggest and best event ever, we could use your support. We kept the entry costs down so everybody can afford it, we have a title sponsor (Mini Sport USA) to help make the event happen to our standards, now we would like to embellish and add to it. Many of our members bring Mini and non-Mini items for the silent auction! (Note, let us know ahead ASAP if you are bringing something so we can add you to the "Thanks" list!) Or if you would like to support/sponsor the Mini 56 with either cash or merchandise (for an auction or giveaways) please click HERE for more information. Sand blasted mugs donated by Dave at Sign Masters for the silent auction! Support the club and the event; Bring something for the silent auction. Their logos are links, visit them and see some great Mini stuff! See their 400hp AWD Mini! Jim Watson leaves no broken Mini behind!! The official CMU email support/program iMembers DB.